Welcome from the Enrollment Management Division at Dixie State University! We provide collaborative leadership in planning, developing, and leading strategic enrollment initiatives that support the institutional mission and values. Additionally, the division helps the institution meet the goals of the campus-wide strategic plan to recruit, retain, and graduate successful students. 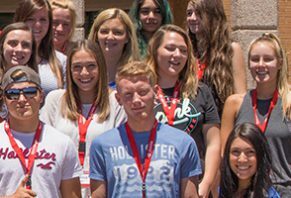 From Admissions and Financial Aid & Scholarships to Testing and Registration, we provide top-quality service that is personalized, accurate, professional, and student-centered. Come visit us in the Holland Centennial Commons building, first floor (admissions, financial aid/scholarships, registration) or the North Plaza (testing.) We would love to meet you.